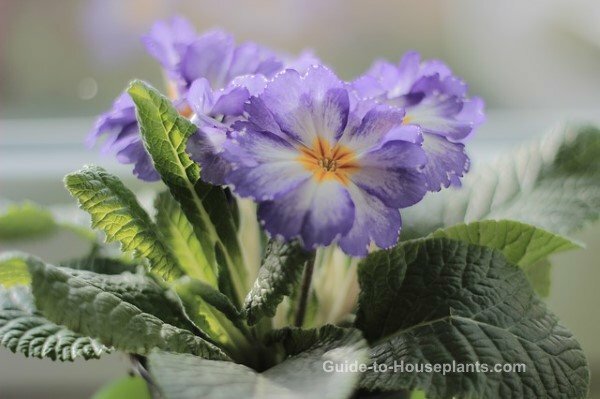 Out of hundreds of primrose flowers species, there are just a few that are available from florists mid-winter through spring and grown as house plants. 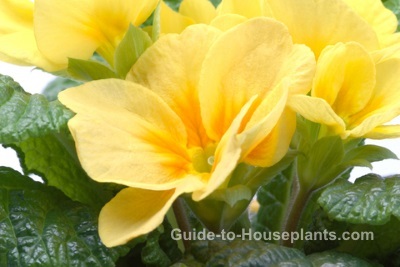 Give your primrose plant plenty of light and you'll enjoy a long season of blooms. English primrose (P. polyantha), shown here, produces a mound of bright, fragrant blooms in pink, purple, yellow, red, orange, white, and bicolors, and often have yellow centers, called eyes. Its colorful flowers grow above a rosette of mid-green oblong leaves. Fairy primrose (P. malacoides) has star-shaped flowers on tall stems. Another tall variety is German primrose -- also called poison primrose, its leaves can cause skin irritation -- (P. obconica) with fragrant blooms in shades of white, lilac, red, and pink -- each with a green eye. Chinese primrose (P. sinensis) is a small plant with ruffled blooms in shades of pink and lilac. Choose plants with buds that have just begun to open. You'll enjoy several weeks of beautiful blooms. 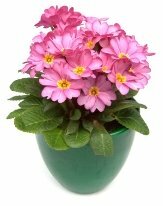 Make your primrose flowers last longer by keeping them in a cool spot, lower than 65°F/16°C. If your plant came from a florist shop with a plastic or foil wrap around it, take it off. Blocking the drainage holes in the pot may cause the roots to rot. Want to cover a plain nursery pot? Slip it into a cachepot (a decorative container without drainage holes). I put pebbles in the bottom to keep the inner pot above the drainage water. 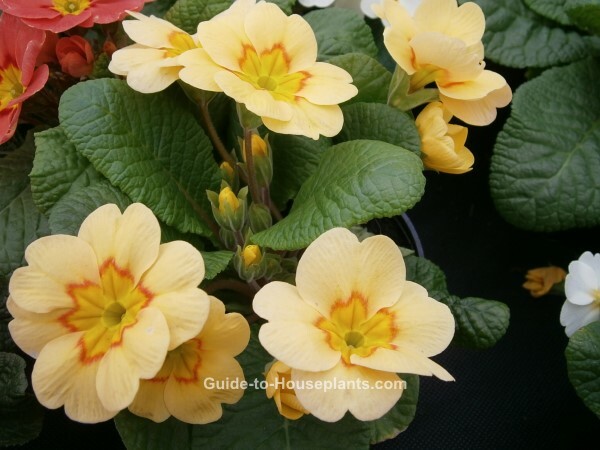 Primrose typically blooms for several weeks and is often tossed out after flowering because it is difficult to regrow. However, P. polyantha can be planted in a shaded spot outside in the garden for more seasons of blooms. The biggest challenges of keeping this indoor beauty happy are its moisture and light requirements. Dry soil or direct sun will make primrose flowers wilt. Find a cool place for your plant. A bright sun porch is ideal. Set several plants together on a decorative tray. Somehow their bright contrasting colors tend to complement each other in a group. 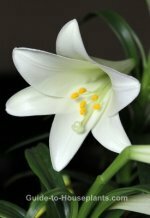 Or display them with other winter-blooming plants, such as kaffir lily, fragrant jasmine or cyclamen. Pinch off spent blooms to extend blooming time. Brown leaf tips could be caused by dry air or a buildup of soluble salts in the soil. You can easily flush salts by slowly pouring room-temperature water over the soil. Wait till water drains out the drainage holes, then repeat a couple more times. Scorched leaves (dry, brown spots) are caused by harsh sunlight. Keep your primrose plant in bright, indirect light indoors. If you set your plant outdoors in the spring, keep it in full shade. Watch for spider mites. Dry indoor air in the winter months encourages these pests to invade house plants, another reason to keep the humidity up. You'll first notice faint webbing on the undersides of leaves. If your plant is badly infested, get rid of it. These harmful pests will quickly move on to your other indoor plants. Light: Bright, indirect light. Keep plant out of direct sun, which may cause it to wilt or develop brown scorch marks. Water: Keep soil evenly moist. Primroses need frequent watering to make them happy. Keep an indoor watering can nearby so that your plant won't go thirsty. This plant wilts quickly when the soil is dry. Use a pot with drainage holes to prevent soggy soil, which can lead to root rot. Yellow leaves are a sign of overwatering. Humidity: Needs moist air. Set pot on a humidity tray to raise the humidity around it. Don't mist because primroses have hairy leaves that trap water, which leads to fungus. Temperature: Cool to average temperatures 50-65°F/10-18°C. Blooms will stay fresh longer if kept at a maximum of 65°F/16°C. Fertilizer: Do not fertilize when in bloom. Propagation: Sow seeds in late fall for winter blooms.